It’s no secret that plant foods are good for you. Study after study supports the benefits of fruits and vegetables in staying healthy and preventing chronic disease. And many people all around the world are taking these recommendations to heart, increasing their consumption of plant foods as part of their regular diet. For the past year Nikki and I have included more raw foods into our diet. I’d say we eat 80 or 85 percent raw. I do understand that this is not an ideal lifestyle and a diet plan for everyone, however I believe that all of us could benefit from eating lighter and more vibrant food. Think of it as including new foods as opposed to removing old ones. Kelp noodles typically have 3 ingredients; kelp, sodium alginate and water. Kelp is a kind of seaweed, or algae, that grows in the ocean. Sodium alginate is a salt derived from seaweed. These simple ingredients make kelp noodles a healthy alternative to pasta because seaweeds are nutrient-dense and are full of minerals. 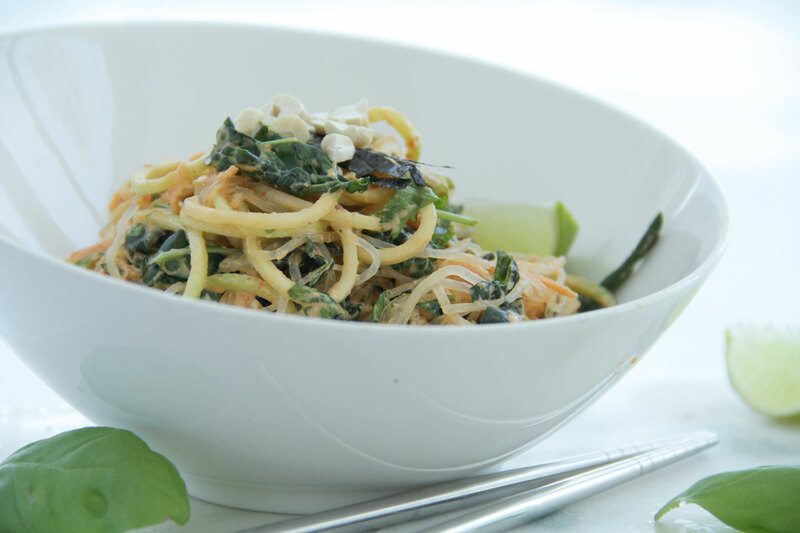 Kelp noodles contain zero fat, zero cholesterol and zero sugar. On top of all that, they are gluten-free! Kelp is naturally rich in iodine and contains over 70 minerals and trace elements like potassium, magnesium, calcium and iron. The nutrients in kelp are commonly linked to your thyroid gland, but are potent enough to protect against cancer and radiation exposure, detox, support normal brain development in babies, and maintain healthy eyes, skin and hair. This recipe is full of flavourful raw foods, gluten free and can be made in less than 20 minutes. It's light and satisfying. This is the kind of food that will make you feel vibrant and alive! 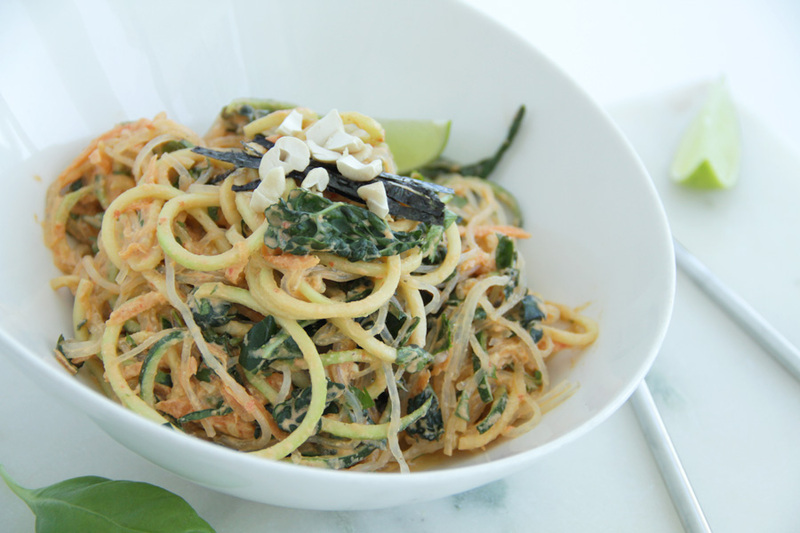 To make your zucchini noodles, use a spiralizer on the thick noodle setting. 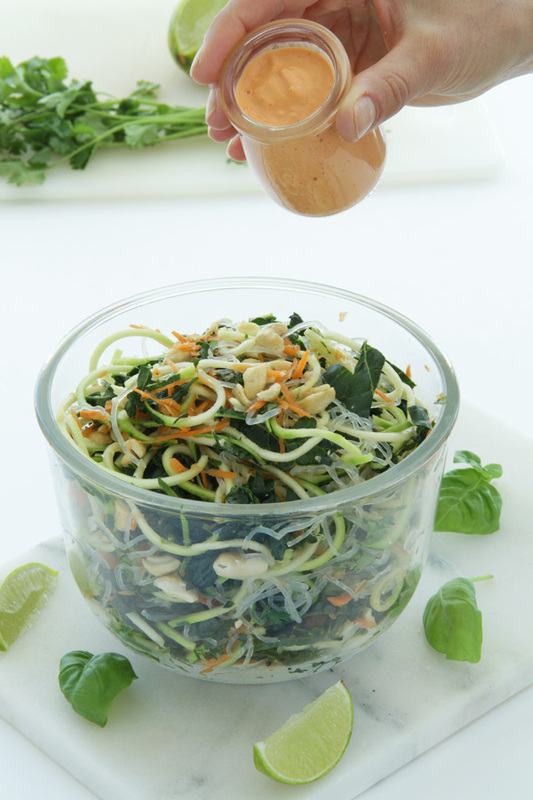 If you don't have spiralizer you can simply cut the zucchini into thin long strips or use a potato peeler to get a noodle like effect. 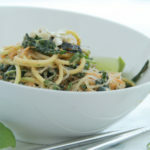 Place the kelp and zucchini noodles into a large bowl. 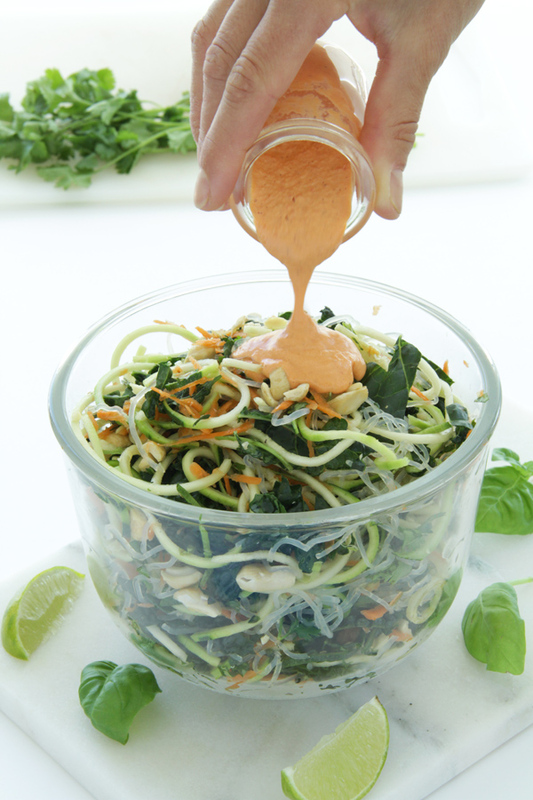 Mix in crushed cashews, grated carrot, thinly chopped kale, cilantro and basil. Set aside. Blend all the sauce ingredients in a blender until smooth. Pour ½ cup of sauce over the noodles and gently mix in. And more sauce if needed, until the noodles are thoroughly coated with sauce. Serve, garnished with seaweed and lime. If you have the time we suggest that you soak the kelp noodles in warm water for 10-15 minutes. Shake them dry, then pat them very dry with a paper towel or kitchen towel before using. We hope that you enjoy this raw vegan meal!